Although smoothies are touted as a healthy and filling beverage, oftentimes they are filled with fat and sugar. This recipe keeps it simple and nutritious by using fresh or frozen strawberries and bananas, orange juice concentrate, and vanilla soy milk; you don't need to add yogurt since the banana alone makes it plenty thick and creamy. 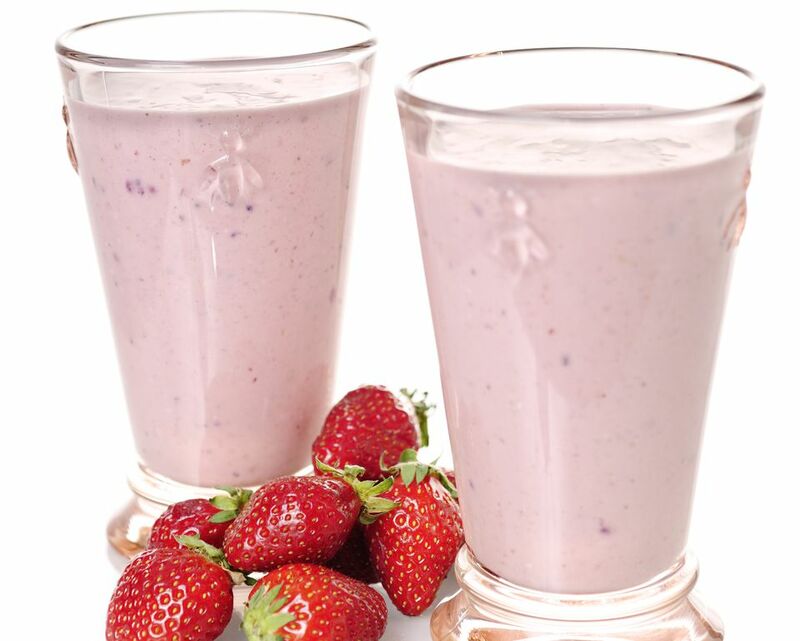 Place strawberries and banana in a blender or food processor. If using fresh strawberries in place of frozen, add ice. Top with orange juice concentrate and soy milk. If using a blender, you may have trouble pureeing the strawberries, especially if they are whole. If so, stop the blender, remove it from its motor base, take off the cover, and use a spoon to push the strawberries down into the blades. Replace the cover and puree until smooth. It is best to use only one frozen fruit; if you blend both frozen strawberries and banana the smoothie will most likely be too thick. You can use plain soy milk (or regular milk) if you like, but since the vanilla soy milk will bring a bit of sweetness to the smoothie, you may find it isn't sweet enough; feel free to add a little honey, agave syrup, or sugar to taste. To add even more nutrition to this smoothie, you can throw in some chia seeds, flax seeds, or wheat germ. And if you have other berries on hand, replace some of the strawberries with blueberries or raspberries, fresh or frozen. Of course, smoothies can include almost any fruit—and several vegetables—so feel free to substitute and get creative. If it's the heat of summer, try a watermelon smoothie with ginger and lime; a blood orange and strawberry smoothie is a nice change of pace, as is a cantaloupe smoothie with orange juice. If you'd like to add a little bit of green to your drink, give a kale and banana smoothie a whirl, or a smoothie with blueberries, banana, and spinach.